Today I'm doing an A-B comparison of the same beer. It's not a blind comparison since I don't have anyone here with me to help implement that. Yes, that's right. I drink alone! The comparison is based on canning dates around 8 months apart and the new can design. Pretty superficial, huh? Yeah, I know, but go with it. Old Chub Scotch/Scottish Style Ale is brewed by Oskar Blues Brewery in Colorado. I think I just found another difference. The older can was brewed in Lyons and the newer in Longmont. Besides the differences noted above, the other very obvious difference is the older can calls this a Scottish Style Ale and the newer a Scotch Ale. 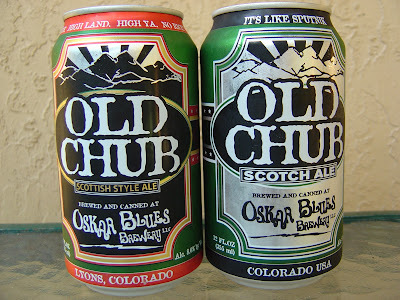 (As if it weren't hard enough to call it "Old Chub"! Get it? That's what she said!) I bought both of these cans on the same day a few weeks back--Ed and the Total Wine gang were nice enough to age the older one, though I doubt they knew it was in the name of science. So let's get going. The "Old" can is the Scottish Style Ale, "Canned With Care" on 01-13-10 @ 13:07 in Lyons. The stamp also says "Chug My Chub". Around the top rim of the can: "HIGH ALTITUDE. HIGH ATTITUDE. HIGH LAND. HIGH YA. NO RICE!" This can is a green and red plaidish venture with white and gold lettering. Rich caramel aroma with a hint of toffee and nuts. Silky smooth caramel flavors, very rich and a little sweet. Some vanilla and plenty of the 8.0% alcohol come in next, with the latter providing a warming and bourbonish experience. (Yes, I know that's two "ish's" in one paragraph, thanks for pointing that out). There are plenty of other flavors. Brown sugar, chocolate, cherries. Creamy and not overly sweet. This has a thick body, a little syrupy with low to medium carbonation. The syrupy flat nature is perhaps the one negative. A complex, flavorful beer and I would not hesitate to buy this again. Wait! I did buy it again. 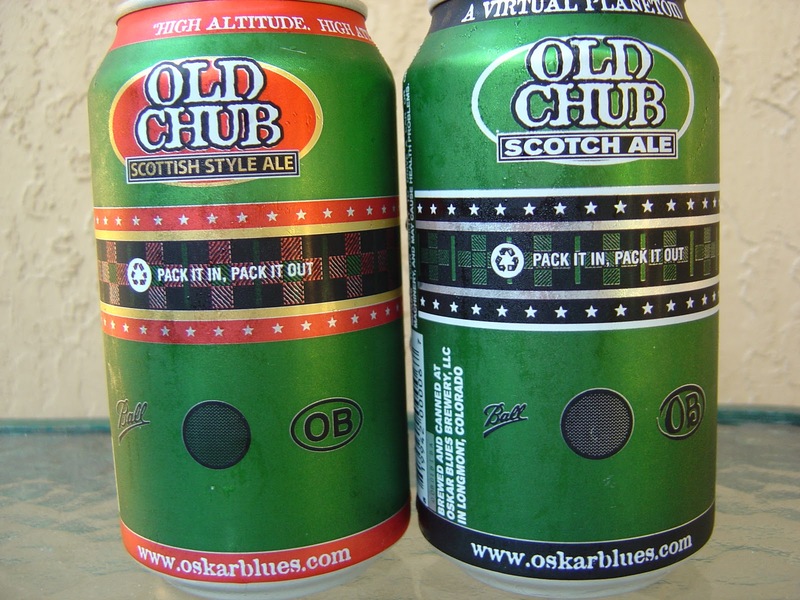 The "New" can, the Scotch Ale. Without digging through press releases or other time-wasters, I am betting they feel the name change more properly describes the style and influence. OB is welcome anytime to do their own post or rebut anything I say, even trash me, so I'll stop there. This one was "Canned On" 08-25-10 in Longmont. "MALTFEASANCE" says the stamp. Also, around the top, a new slogan. "IT'S LIKE SPUTNIK. A VIRTUAL PLANETOID." Green can, no red with the same silver, white and black front theme. OK. One other comment is that neither can popped with excitement (or carbonation). Sample B here has a less interesting aroma, although that could be because the other can already completely passed my palate. Weaker, and I'll stick by that. Flavors start out a little roastier and rougher around the edges. Same sweet caramel flavors, but more vanilla and toffee, and definitely less richness. Barely more carbonation is a plus. Not as sticky and syrupy, less boozy, with a dryer finish. Oh and thinner. These are obviously the same beer, just a different seasons with a different batting averages. Probably if you marry A and B you'd get some super-beer (On a similar note, it's too bad that Frenchie Tony Parker and Eva Longoria are divorcing while I am still unavailable. She'd really like me.) Which did I like better? I'm still not sure. It seems that a little time in the can took some of the edge off and added complexity. Either way, this is a really nice beer that you should definitely give a whirl! Also, keep your eyes open as you'll likely see this post republished in a scientific journal after it goes through the normal peer review! Rob - LOVE OB Old Chub. 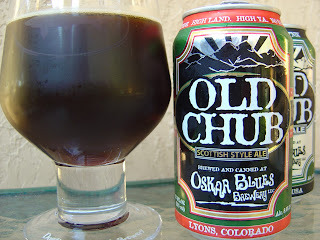 Here's a link to my review from a little while back, in case you're interested - Oskar Blues Old Chub. 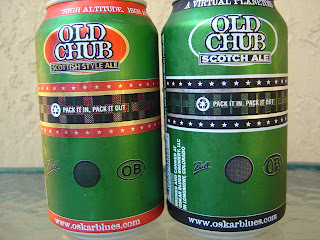 The day I posted the review, my pal from work walks up to me and says, "So Hannah, you like old chub in the can, eh?" Oh the fun one can have. Yeah so there's this hot dog joint in Chicago called Flub A Dub Chubs. Their slogan is "Come in hungry, leave with a chubby." I can't make this stuff up. Really impressed by the ol' A/B split. Many lessons learned. I like to think that old adage about drinking alone is strictly metaphorical. Otherwise...yeah. So it seems I'm not alone in my childish word play. Haha.